Every performance followed by a party with drink, food, and chat on the concept of Indie Theater. $15 suggested donation | You must have a reservation to attend. To reserve, send your name, number in party, and night you want to come to: contact@inversetheater.org or call 646-552-4754. 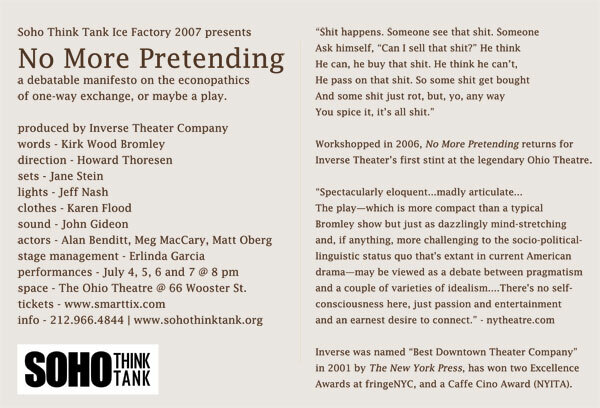 In October 2005, Inverse Theater Company, along with La Mama founder Ellen Stewart and Mabou Mines’ puppeteer Basil Twist, was given a special award for continuous achievement on off-off-Broadway by the New York Innovative Theater Awards. Upon receiving the award, artistic director/playwright Kirk Wood Bromley said to the audience that he felt the term “off-off-Broadway” should be dropped and the term “Indie Theater” should be taken up instead, primarily to shed the pejorative sense of “off-off” and to assume the marketing power of the term “Indie.” In response to Bromley’s suggestion, a movement of hundreds of Indie Theater artists has begun, led by Martin Denton of nytheatre.com. 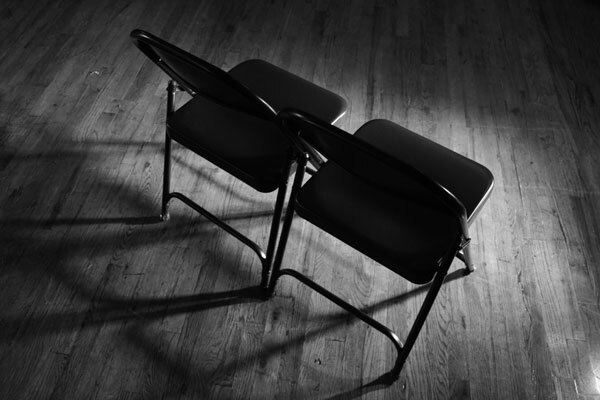 “No More Pretending” is Bromley’s new three person play that serves as both a response to and dialogue with this movement, tackling the many ideas and struggles inherent in the battle to be “independent” in a world in which freedom is a market. Post a comment — Trackback URI RSS 2.0 feed for these comments This entry (permalink) was posted on Sunday, September 12, 2010, at 1:04 am by admin. Filed in Uncategorized.